Twelve months after making his first European start, Tadhg Furlong is determined to get Leinster back to the quarter-final stage. Furlong speaking to the media in UCD earlier in the week. A YEAR IS a long time in any walk of life, but in sport it feels like an eternity. Just ask Tadhg Furlong. This weekend twelve months ago, the Leinster prop — now widely-considered as one of the best in Europe and a potential tourist with the Lions — was preparing for a first European start. With the province having endured a disastrous campaign to that point, losing all four games, Leo Cullen was afforded the chance to blood a young side against Bath in-front of the RDS. Garry Ringrose, Luke McGrath, Peter Dooley, James Tracy, Ross Molony and Furlong all started that day as Leinster thrilled the home crowd en route to a 25-11 victory. The rest, you could say, is history. Four of those players are now full internationals and Leinster are standing on the brink of a return to the Champions Cup quarter-finals. As for Furlong, his career has been on an upward trajectory ever since. The 24-year-old has developed into an outstanding operator at tighthead and his performances on the international stage in 2016 elevated his stature to a new level. He was superb against the All Blacks in Chicago and backed that performance up with similarly impressive displays in the return fixture and the victory over the Wallabies. His ascent to the lofty heights he now finds himself may have seemed like a rapid rise but Furlong has been ‘trucking away’ in the background for some time, gradually strengthening his game and working hard to become the player he is now. “It’s hard to put a finger on it but just a run of games and minutes under your belt to keep your match sharpness up,” Furlong said of his outstanding form. 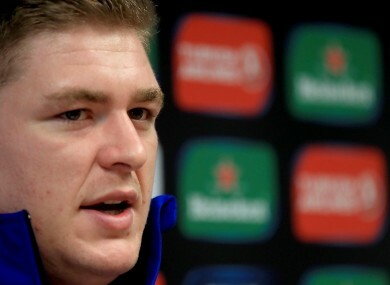 Furlong has plenty of experience of the big games at international level but tonight’s clash with Montpellier (KO 7.45pm, live on Sky Sports 2) is arguably the biggest of his career in a blue jersey. The stakes couldn’t be any higher for the hosts, with victory assuring them of progression through to the knock-out stages. Some form of redemption for last season. “It’s a huge week for the club, they’re a quality team with quality players,” Furlong continued. “It’s a chance for us to book a quarter-final spot if we win and a chance to right a few wrongs from the game over there as well. It’s a huge game for us and one we’re really looking forward to. “It would be huge if we could get through, it was disappointing last year. There’s a lot of young fellas like myself that got a first start last year against Bath and we definitely learned a lot from the campaign. Success is still along way away for this Leinster side but the younger generation have been at the centre of this exciting renewal under Cullen. Three wins from the opening four games in Pool 4 has left the three-time European champions in control of their destiny and knowing two wins from their remaining games would secure an all-important home quarter-final. There is no downplaying the size or scale of that challenge, particularly with Top 14 heavyweights in town, but there is a real buzz around the club at present, an atmosphere engendered by big Pro12 victories over Ulster and Zebre. “Leinster have a proud history in the tournament and not to get out of the group was disappointing and players took that personally last year,” he added. “But there’s a really good buzz around the place, confidence is high and a lot of the young lads coming through the Academy have put heat on to perform. That competition drives performances out of us and I think we’re going to need a big one to be competitive against Montpellier. Email “'There's a lot of us with no medals. We're hungry and want to contribute to the success of the club'”. Feedback on “'There's a lot of us with no medals. We're hungry and want to contribute to the success of the club'”.